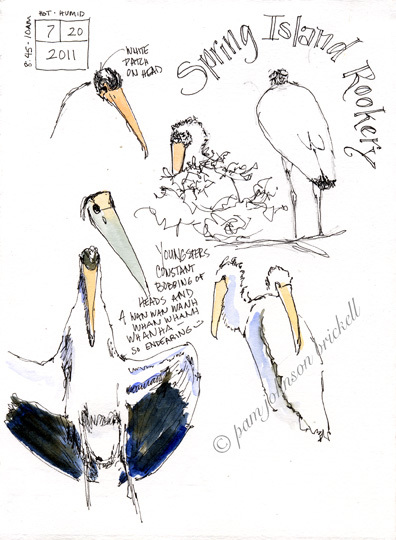 Ever since I saw my first Wood Stork I've wanted to observe, sketch and photograph them throughout their nesting cycle. For the first time ever recorded, Wood Storks chose to nest on Spring Island! Yeah! They're relatively close by and I have access! My first trip to check out the rookery was back in June. I saw a few hatchlings and some Storks were still sitting on eggs. During my June visit, I sat close to a sand trap and suffered many a red ant bite. This time I set up my chair and scope well away from from the sand. I dowsed my self in sunscreen proir to leaving the house and now bug spray. Yuck, but necessary. 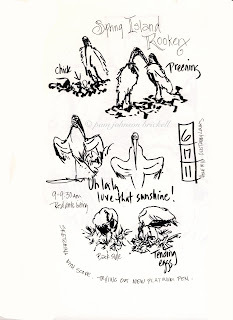 Here are my on-location sketches. The ants found me anyway and they paid no attention to bug spray! I was so warm I kept fogging up the eyepiece of my scope. I managed to get a few good digi-scope images early on. Not real sharp but good enough for my reference purposes. I used the begging juvi to fill a spot on the right side of the journal page. pointed straight up to the adult's head. The beak blends with the dead tree. Nicely animated Pam. And a pleasure to have them nesting I'm sure. I had been wanting to drop a note anyway before you posted this. Every once in awhile I check my blog statistics to see where my visitors come from. I was surprised once again today to see how many come from your link here! Steamy here today with temps headed for 100. But I'm sure it's still better than there. I don't envy anyone steamy weather. What an experience! Neat sketches. 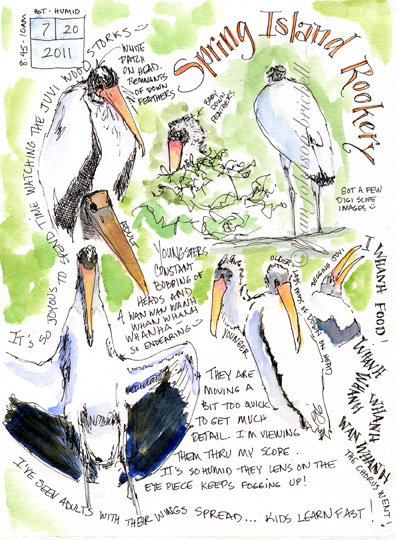 What lovely sketches of such fascinating birds! What a great experience and that you were able to chronicle it! Love the page. Love this post and the story. Except for the ant bites. Ow! Great drawings and entries! 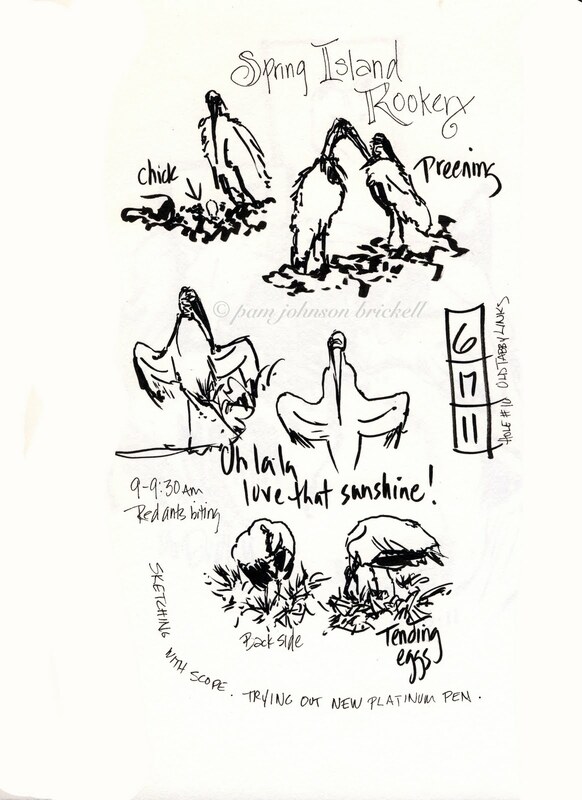 Love the sketches! 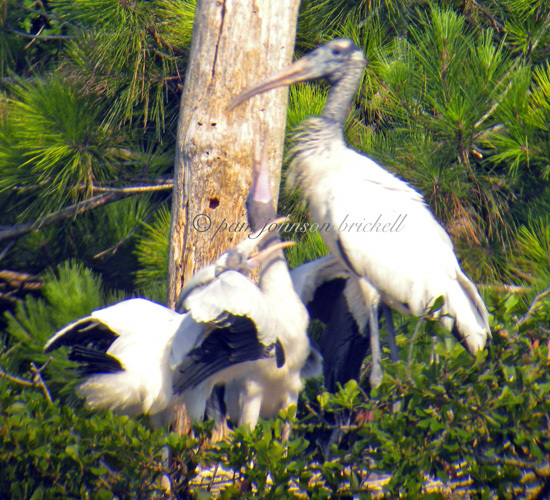 And thank you for reminding me not to take anything for granted -- I see wood storks almost every day in my subdivision, and because of that I have been failing to appreciate their size, their appearance, their rarity in America as a whole, etc. I won't make that mistake again. Wow!, thank you everyone for commenting. I had to be away from the computer for longer than usual and what a nice surprise to see 8 comments! Hi Rhonda! Thanks and yes, watching the care and trials and tribulations that adult birds give and go through is amazing. Thanks, Sarah. I'm a fan of all birds but expecially long legged wading birds and raptors. Thanks for stopping by Matte0. Yes, the are beautiful. Hi Suzanne! Thanks! Silly ants love picnics and anyone who dawdles on their turf - I had enough when one crawled all the way up to my neck to bite!